Copyright, 1880, by T. B. Harms & Co.
On Tom McDonnell's old tin roof, the boys do dance at night. With Kitty Malone and Mary Shea, who sing with all their might. And Tracy on his instruments will play. If you don't believe I'm right, call around there any night. And you'll find us on McDonnell's old tin roof. To start for home at two o'clock, they say It is too soon. They keep the folks awake all night, they never have their rest. To sing their songs and play their tunes, they do their level best. 'Tis finer than the Op'ra Bouffe. 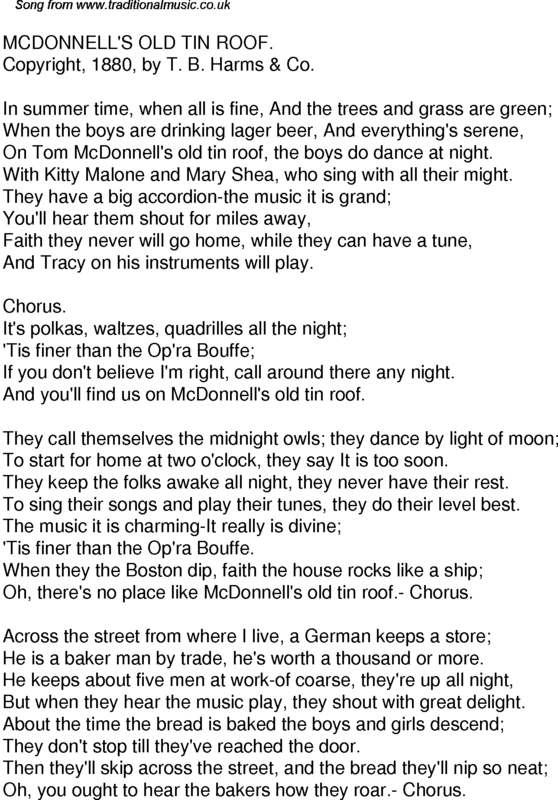 Oh, there's no place like McDonnell's old tin roof.- Chorus. He is a baker man by trade, he's worth a thousand or more. But when they hear the music play, they shout with great delight. They don't stop till they've reached the door. Oh, you ought to hear the bakers how they roar.- Chorus.